Stainless steel, light weight steam plate 207mm (8¼") x 427mm (16¾"). The HTW's steam plate design directs steam towards the wall surface and creates even distribution of steam over the whole of the steam plate area. Ergonomic handle design allows easy handling of the steam plate as it is moved across the wall surface. 360° swivels at steam plate and steam tank steam hose ends, minimises strain on steam plate and hose and reduces user fatigue. 4m (13') steam hose, light weight and durable. Steam plate rails and machine body provide storage of power cable and steam hose in one integrated design eliminating the risk of parts being lost. Steam stripper body covers steam tank preventing accidental contact with hot tank surface. Thermal cut-out operates at low water level, eliminating the need for the user to manage the water level. Nickel-plated heating element specially designed for the demands of steam wallpaper stripping. Design allows two thirds of the element to remain covered in water when low water is reached and the thermal cut-out operates. Marine alloy steam tank guaranteed for life. 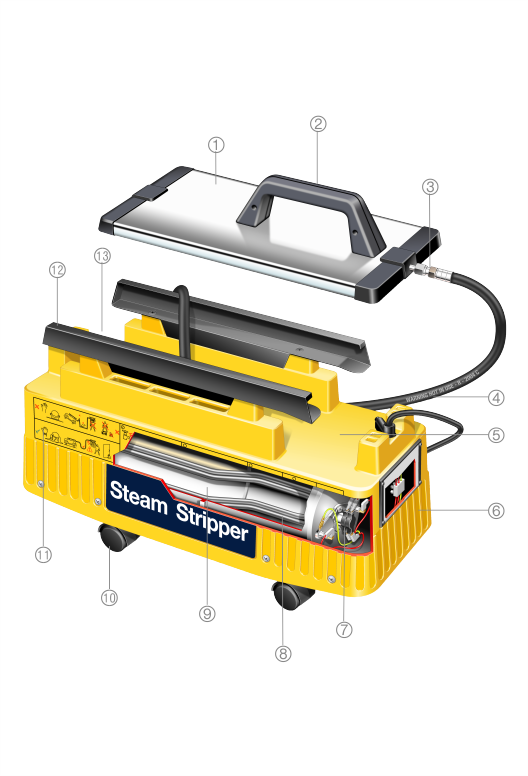 Castors allow steam stripper to be moved easily and safely around the work site. Easy glide steam plate rails for steam plate storage. Anti-scald system prevents the sudden escape of steam and hot water due to operator misuse or damaged filler gap.